Japan Earthquake: After last March’s disaster quake and tsunami along with nuclear crisis another quake of magnitude 7.4 stroked the north eastern Japan on Sunday once again triggering a Tsunami alert. 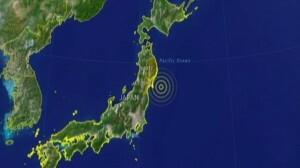 There was no sign of further damage along the coast or to the Fukushima nuclear power plant. Japan reactors from Fukushima nuclear power Plant should be burried like Chernobyl?? World is discussing Japan reactors from Fukushima nuclear power Plant. The cooling of fuel rods is in process. Yesterday authorities attempted to cool the reactors by dropping water from helicopters but unable to control the overheating reactors. Some 330 Fukushima emergency workers were trying to keep the nuclear power plant cooled with seawater, to keep fuel rods from overheating and releasing more radioactive material. Germany announced a temporary shutdown of 7 nuclear plants. German Chancellor Angela Merkel said that all 7 of the country’s nuclear power plants which began operation before 1980 would be provisionally shut down. The decision comes amid fears sparked by the crisis under way at Japan’s tsunami-stricken nuclear power plant. Latest Blast at Japan’s Fukushima Daiichi nuclear power Plant! The fresh explosion at the nuclear plant happpens on Monday causing smoke in the air. Japanese authorities have been working desperately to control the devastating nuclear situation came up due to Friday’s massive quake and tsunami.